On 16 Aug. 1950 the board of trustees of the Cherokee Historical Association in Cherokee-sponsor of the popular outdoor drama Unto These Hills-approved the idea of constructing a replica of an eighteenth-century Cherokee village. The research necessary for creating an accurate replica was to be performed by the Tsali Institute for Cherokee Research, established by the board in May 1951. Noted archaeologists and anthropologists working on the village project and serving as members of the Tsali Institute included Joffre Coe (University of North Carolina at Chapel Hill), A. R. Kelly and W. H. Sears (University of Georgia), T. M. N. Lewis and Madeline Kneberg (University of Tennessee), and John Whittoft (Pennsylvania State Museum). P. A. Willett supervised construction of what became Oconaluftee Indian Village on a wooded, 40-acre tract in Cherokee near the Mountainside Theater, where Unto These Hills is performed each summer. The village opened to the public in August 1952, with Walter Jackson serving as the first manager. 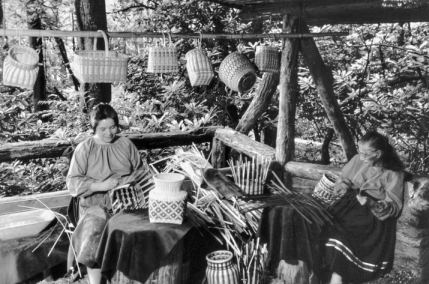 Oconaluftee Indian Village was designed to depict life in an eighteenth-century Cherokee community. Cherokee men and women, in traditional attire, perform ancient rites and provide traditional craft demonstrations. The village also features replicas of a seven-sided council house and homes and other structures from the 1700s. Guides in native attire interpret for visitors the social structure of Cherokee society. A botanical garden and nature trail became a part of the village in 1954. Total paid attendance at the village had topped 6 million by 2000.